The Polish Cultural Center presents the meet-the-author event with Dominika Wrozynski who will be reading from her poetry collection American Accent published in 2018. Ms. Wrozynski is an Assistant Professor of English at the Manhattan College in New York. American Accent won Evening Street Press's Sinclair Poetry Prize. The 14th Pierogi Fest brings the usual Polish dumpling extravaganza serving several kinds of pierogi: meat, potato & cheese, blueberry etc. with 10 pierogies for $10; also available: sausage & sauerkraut, Polish beer, tea, coffee, soft drinks and desserts. Free attractions include folk group performances: Polish Choir at 1 pm & 2:30 pm and Pawel & Olimpia Duo at 12, 2 & 3 pm. Eat leisurely, listen to Polish music and have a good time. On sale: Polish cutout art, Polish tee-shirts, Polish sports scarves. Spokolonia - Polish Community of Spokane invites all Polish-Americans to a potluck gathering and a sing-along of popular folk, Polish and American tunes. Bring a guitar or other instruments and some food to share. Organized by Helena Pickering and Jozef Sloma. This event was moved here due to the snow situation in Seattle in early Februaru. New Orlean's Mardi Gras in Seattle! 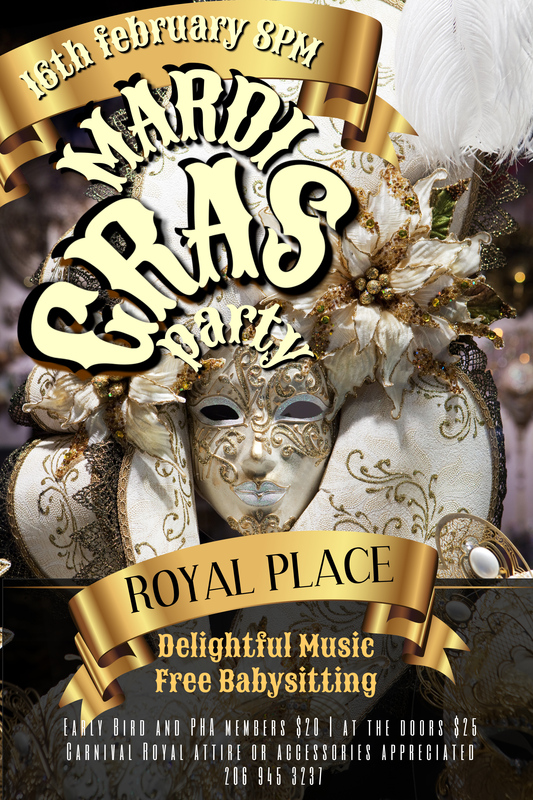 The Polish Cultural Center throws a royal carnival party this year, so become a royalty for the night and have some fun! Royal carnival accessories or full attire appreciated! Evening schedule: 7:30 pm doors open, 8:00 pm a charming musical surprise (yes!) with live musicians, 8:30 pm to 1 am dance to hot hits! The Polish restaurant will be open from 6 pm to 10 pm. Free baby sitting will be available on the site. More: for reservations call 206-946-3237, mention baby sitting while you are at it. Polish Cultural Center presents the 3rd of May celebration marking the anniversary of the first Polish constitution, which was enacted in 1791. The program prepared by Barbara Strutynski highlights the 100th anniversary of Poland's regaining independence in 1918. The restaurant at the Polish Home is open from 12 pm to 4 pm. 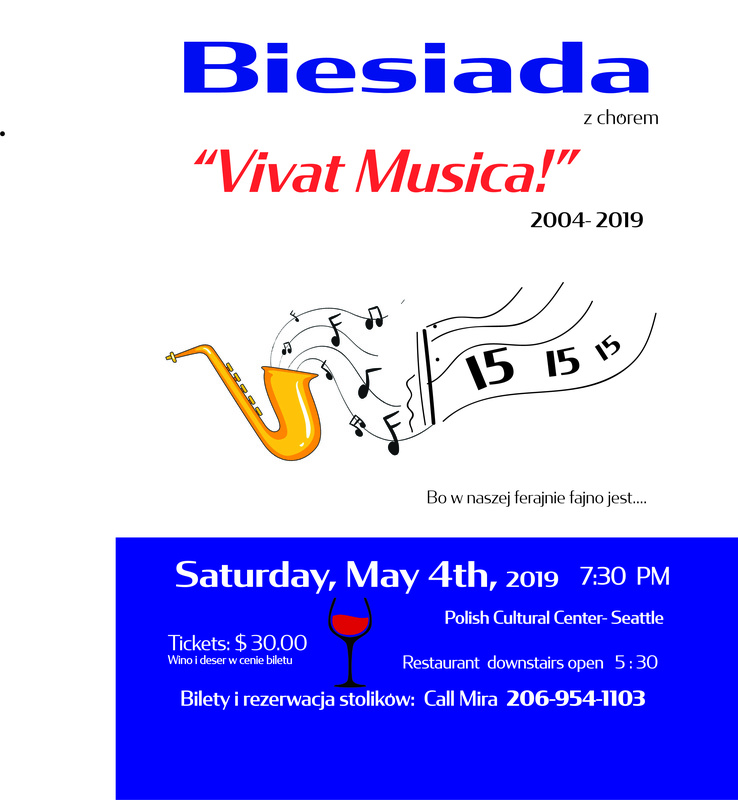 The Polish Choir Vivat Musica invites everyone to a Biesiada concert celebrating the 15th anniversary of creating the choir in 2004. This will be another great sing-along evening with with the choir and guest performers leading old time classics. The Polish Home restaurant will be open from 5:30 pm. Where: at the Polish Cultural Center Dom Polski; tickets $30 include a glass of wine and a dessert; for reservations and more info please contact Mira at 206-954-1103.